Tania and I have just recently returned from quite the adventurous vacation, and while that experience will inspire several future blog posts, right now I’m just enjoying the comforts of home and of the familiar. 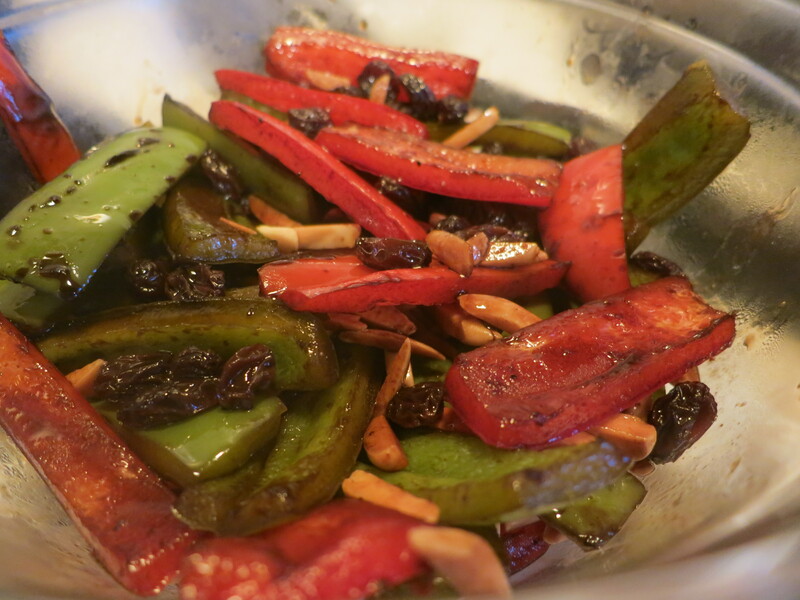 In light of that, when the time came to select a recipe for dinner recently, I opted for something tried and true: Balsamic Chicken with Peppers and Almonds. Originally taken from Cooking Light (I think), this recipe has become a reliable component of my cooking repertoire. The blend of sweet and salty stemming from the combination of peppers, raisins, toasted almonds, and balsamic vinegar make this a recipe that covers all of its flavor bases. Add to that the flavor complexity provided by the Parmesan cheese in the breading on the chicken, and the result is a recipe that is sure to please. As should be obvious, this isn’t an especially fancy or gourmet recipe. But does that really matter when it tastes good?